If you are an iOS user then chances are you chose the iPhone over an Android smartphone. Even though a large number of iOS users don’t like Android for different reasons there’s still some level of fascination among all of us about the alternate universe. If you are someone who would like to take a peek at the world of Android and its design without abandoning iOS then try the new Andrios tweak from Cydia. The tweak brings the best Android experience to iOS that we have ever seen complete with widgets, iconic Android homescreen, on-screen navigation buttons and much more. Andrios takes inspiration from both Android Lollipop and KitKat editions. A great thing about this tweak is that users can disable parts that they don’t like, so if you don’t want to have a certain aspect of the tweak while keeping the others you simply have to flip a few switches from its Settings page. So what features does Andrios brings to iOS? Well the list is quite long, we will mention each and every one of them with a short description to let you know what they do. Again, you can disable the features you don’t like or don’t find useful. Switches Widget: The toggle or switch widget that you can see in the first screenshot above allows users to turn on or off system settings such as WiFi, Bluetooth, Location Services, Do Not Disturb and Auto Brightness. This particular widget looks exactly like the one found on real Android and adds to the beauty of this tweak. Action Bar: Action Bar is the iconic Android button bar that appears at the bottom of the screen with navigation buttons. Andrios’ Action Bar features button for Back, Home and Multitasking. With Back button you can quickly return to the previous app while the home button takes you to the homescreen much like iOS’s own home button. Lastly, the multitasking or ‘Switcher’ button lets you access the multitasking screen. You can also long press this button to clear all opened apps. Alternate NC: Alternate NC is basically an Android inspired Notification Center for iOS that allows users to access Settings toggles, change brightness and of course view pending notifications. There are multiple settings for Alternate NC that you can configure from the Settings. MiniPlayer Widget: The MiniPlayer Widget lets you control the now playing music without launching the Music app. You can pause, play, forward, reverse, change track, quickly launch now playing app and more. Power Menu: The power menu is a menu that appears when you long press the lock button. 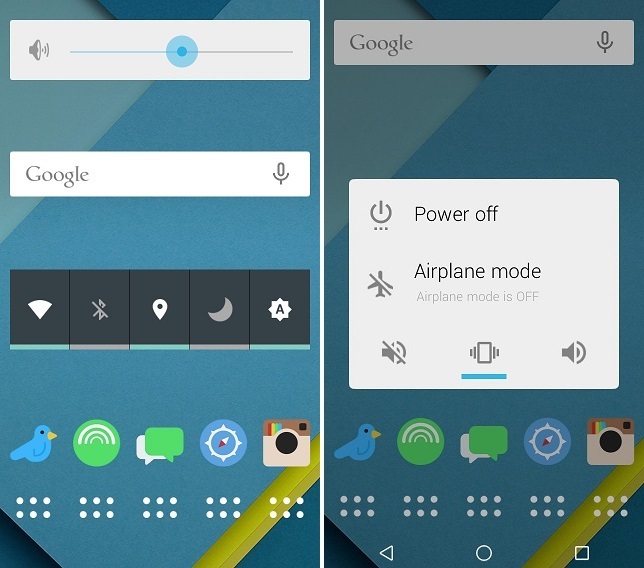 It allows users to turn off the device, put it in Airplane mode as well as enable silent or vibration mode. Unsurprisingly it completely looks like the power menu found in Android. Search Widget: Android features the iconic and useful Google widget that allows users to quickly perform a search right from the homescreen. Andrios also brings that function to iOS. The search widget features its own web browser and shows the result right on the homescreen. You can also tap a button to access the same page in Safari. In addition to all the features mentioned above there are many other small features that you will experience as you use the tweak on your device. You can download Andrios on your jailbroken device for $3.99 from the BigBoss repo. It runs on both iOS 8 and iOS 7.